This is a quick and simple guide for beginners in this field on how motors are connected to ESCs (electronic speed controllers) correctly. 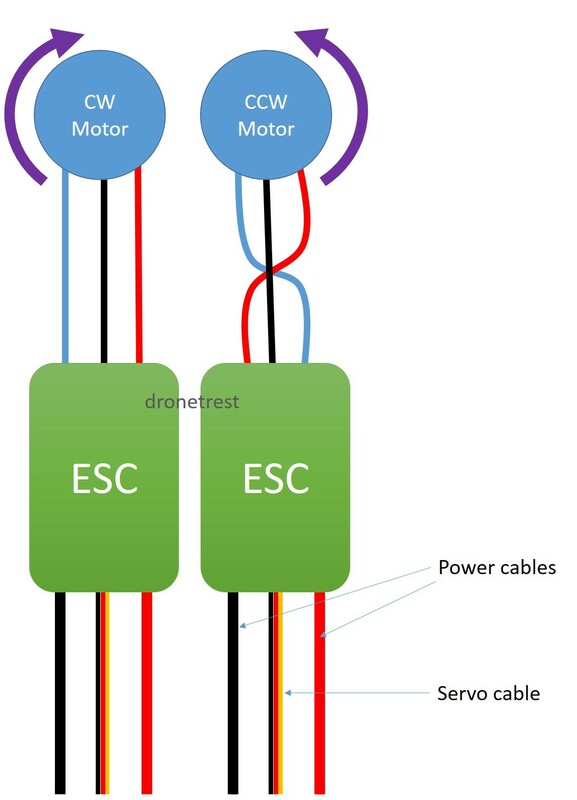 Firstly, on most multi-rotor platforms, you have an equal number of clockwise (CW) spinning motors and counter-clockwise spinning (CCW) motors; these two motors need to be connected to their respective ESCs differently. As a note, you generally need a equal number of CW and CCW motors to enable the platform to yaw (turn side to side). You can see the correct connection in the diagram above. For the CW motors, the cable connection between the two components is intuitive, the left goes to the left, the middle to middle, and the right to the right. When connecting the CCW motor on the other hand, you must be careful to switch things up a bit. You see in the diagram that the left-hand cable on the ESC must attach to the right-hand cable on the motor. Equally, the right-hand cable on the ESC must connect to the left-hand cable on the motor. The middle cable is left and this simply connect to the middle cable of the motor. These different connections are essential for making the motors spin in the correct orientation and therefore essential to getting your multi-rotor platform in the air. Below is an example of some ESCs connected to CW and CCW motors. 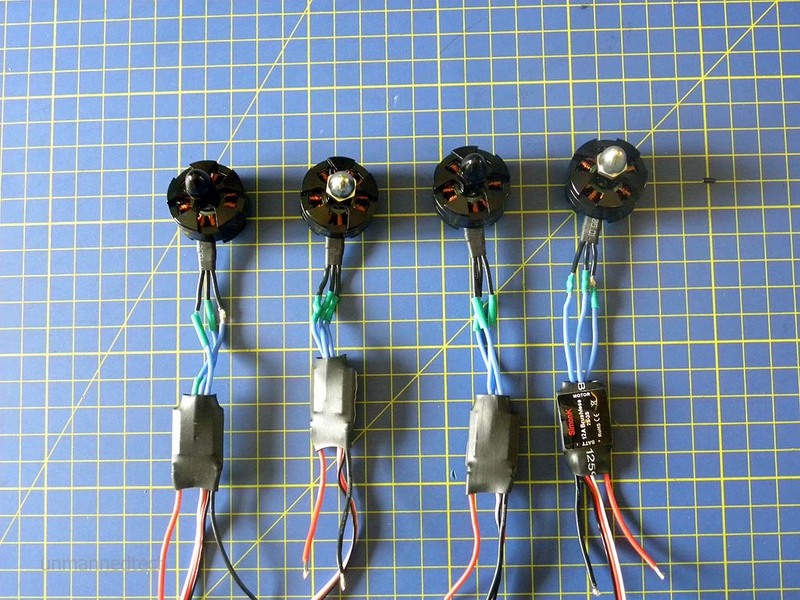 If you have finished building your drone and find that one of your motors is spinning the wrong way, this will be because you have connected the wires the wrong way around. An easy fix would be to simply swap the two outer wires. 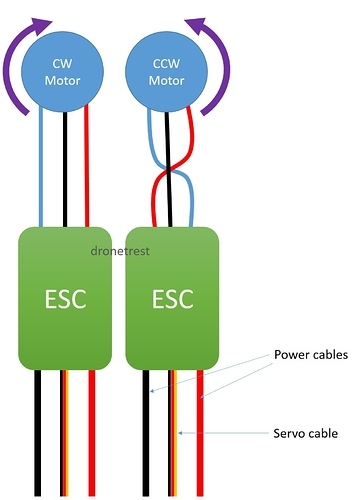 There’s no need to worry, as with brushless motors, there is no wrong way to connect the motor to ESC wires as there are no positive or negative wires. If you want to find out why, check out our Brushless Motor Guide and also our How an ESC Works (coming soon) guide. Your first diagram does not agree with the photo below it. Which motor should be crossed? Hi, Yes it does seem that they were contradictory! We have modified the article now to show the correct information. In summary, clockwise = wires not swapped, counter-clockwise = wires swapped. Also one thing to bear in mind is that most ESC today use BLheli so you dont realy need to care about this anymore as its very easy to connect them to your PC and just reverse the ESC direction via software. This makes it very easy to build a quadcopter as you dont realy need to care about the motor wire order anymore. I explain this in my upcoming BLheli Guide using cleanflight passthrough mode. Easy if you have the USB dongle and a steady hand. Swapping the wires is even easier. Or is the dongle not needed with “passthrough mode”? Thats the nice thing about passthrough mode, you just connect your ESC up to your FC, then connect your FC to your PC and you can change all ESC settings in one go. So your flight controller acts like the USB linker device for all the ESC connected to your flight controller. I will have a tutorial about this available soon as I am just finishing it off via the link above. Black Cap Cw and white cap ccw?